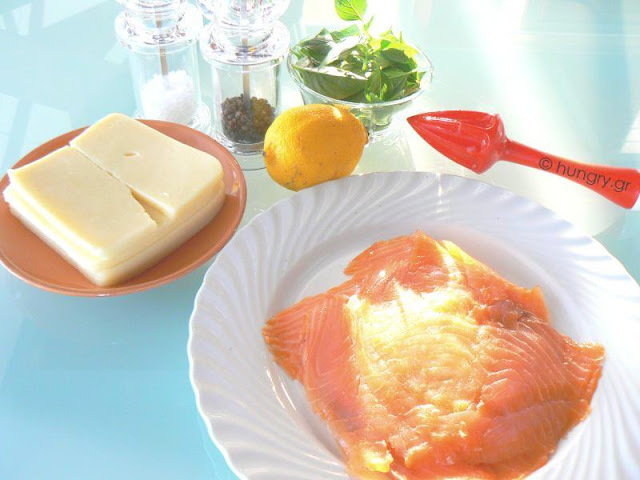 Smoked salmon and mozzarella, fragrant basil to flavor these two ingredients into a fine appetizer. A light, green salad, an avocado dip and slices of toasted bread accompany it to balance the oily taste. In a small bowl, add the lemon juice, olive oil, salt and pepper. Spread a transparent membrane in a form 15×10×8cm/ 5.9″×4"×3.1″. Use a brush to spread a thin layer of lemon-oil mixture. 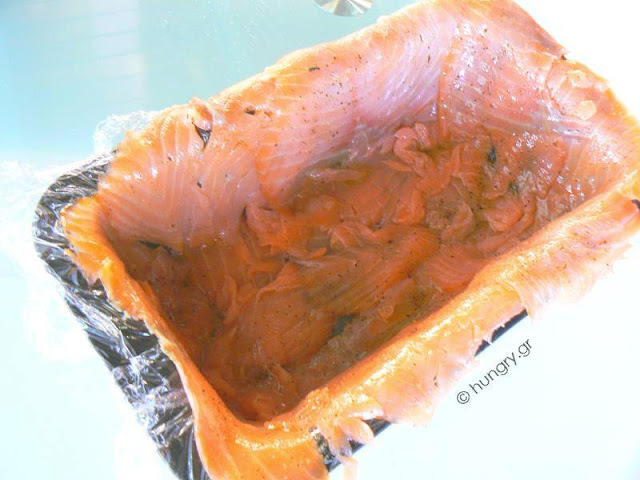 Cover the the form, sides and bottom with thin slices of salmon brushing with lemon-oil mix. Wash and wipe the basil leaves. Lay a layer of mozzarella slices and spread over a few basil leaves. 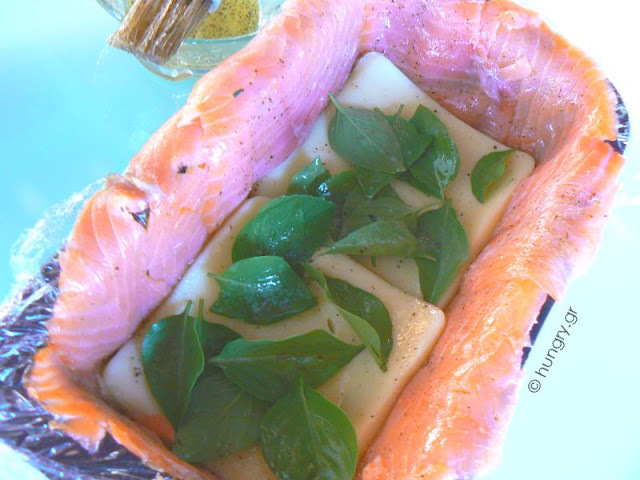 Cover the salmon with basil leaves. Repeat, until you run out of ingredients. At the end, use the excess transparent film to cover the form. Place a heavy object (e.g. 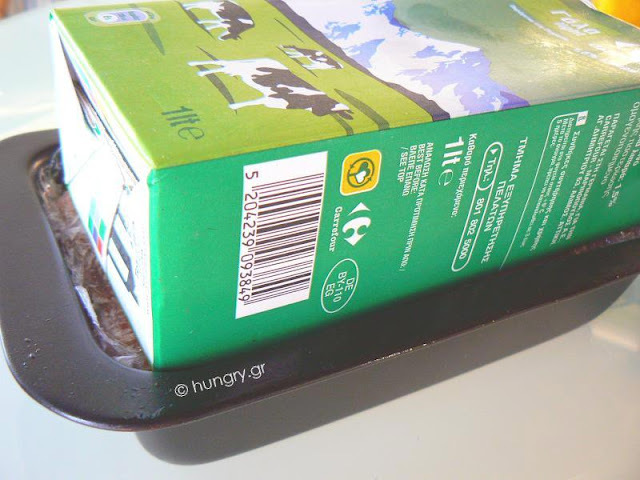 1 milk box), which pushes the layers of salmon-mozzarella and refrigerate overnight. The next day, when we want to serve, roll over the form onto a platter. Remove the transparent film. Serve with a salad and an avocado dip, bathed in a vinegraitte sauce (2 tbsp oil, 2 tbsp vinegar, 1 tsp Mayonnaise, salt and pepper). Toast slices of bread and enjoy a delicious appetizer. Accompanied by a good white wine. Try it. It is ideal for a festive table. Today's dish is a delicious appetizer, that can make any occasion a festive day! It can be offered to our festive table and our guests will enjoy a very hearty, tasty and impressive roll shaped appetizer. 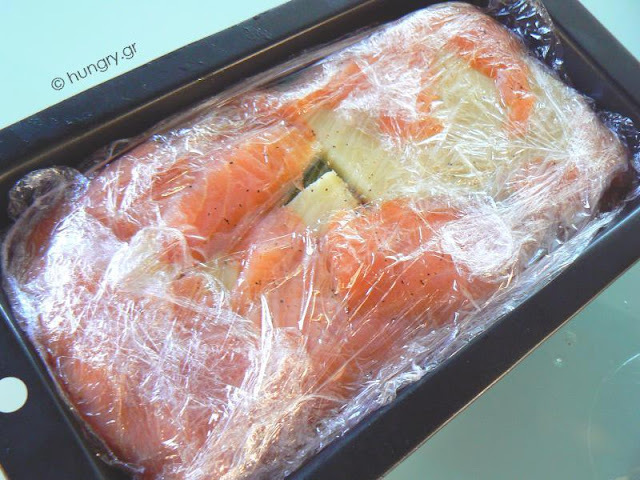 You can prepare it from the day before, without changing the taste! Quite the opposite! It gets tastier and the flavors mix and blend together! 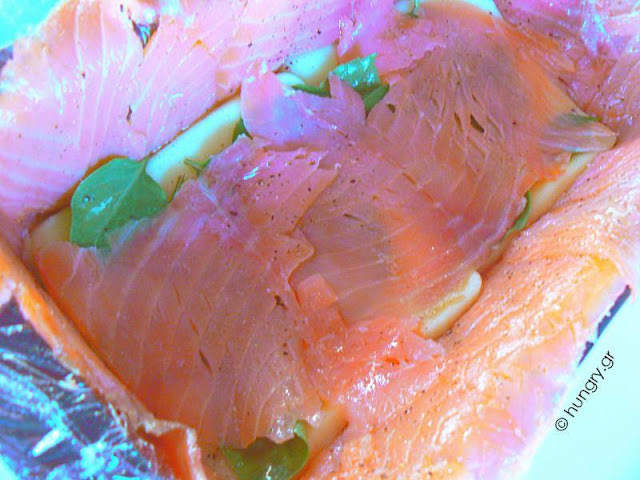 Salmon wears its "formal dress" and accompany our dishes with gourmet style! Serve in slices, to highlight the inside and the colors of the filling. Garnish the serving platter with colorful peppers and cherry tomatoes.